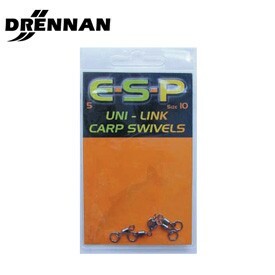 Drennan ESP Uni-Link Carp Swivels - Hi-Performance Uni Link Swivels are made in Japan to exacting standards. 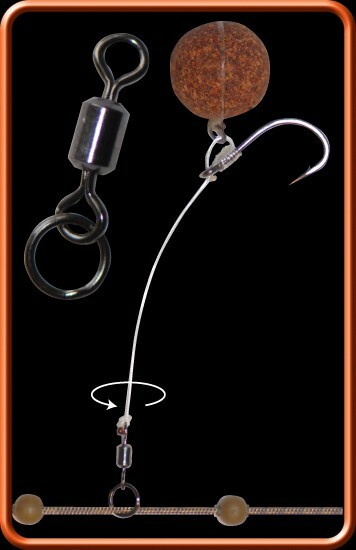 This ensures ultra smooth rotation and improves the performance of any Pop-Up Rig that incorporates a swivel. - On Chod Rigs in particular, the swivel’s ability to spin round and help the hook catch hold in the carp’s mouth is of critical importance. - Can also be used to improve braided or lighter mono hooklinks, reducing tangles and ensuring that rigs lie flat on the bottom - Packets of 5 - Available in sizes 9, 10, 11 to fit all the popular safety clips and in-line leads E-S-P Standard Uni Link Swivels provide a universal hinge and 360 degree movement to otherwise rigid hook links and are ideal for stiff mono rigs and Combi Rigs in coated braid. - They also improve the presentation of lighter, more flexible mono and soft braided hook links, effectively reducing tangles on the cast. - Packets of 10 - Available in sizes 9, 10 and 11 to fit all popular safety clips and in line leads.